"The course is very good condition again this year and we hope it will remain that way for race day. Please remember that you will be running in the mountain west and weather is unpredictable. In fact, it snowed here in [the] Tetons two weekends in a row this month. So, anything could happen on race weekend." 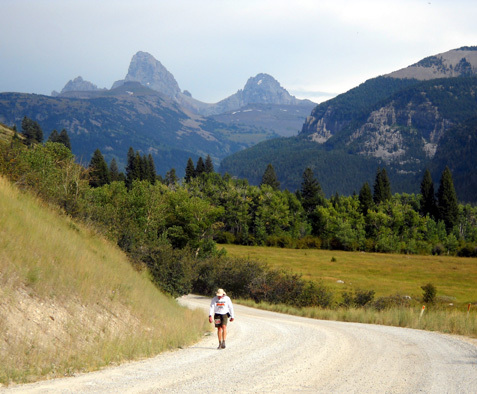 When race directors Lisa Smith-Batchen and her husband Jay Batchen say that it snowed in the Tetons two weekends in a row this month, I think they are talking about August. That's typical in the Rockies at these elevations, so we were prepared for anything when we arrived in the area a few days ago. 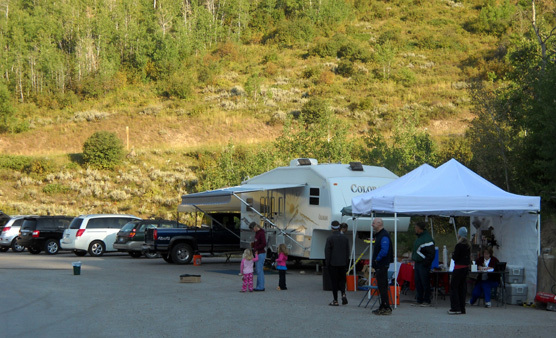 Although the nights have been down into the 40s at our campground in Teton Canyon all week, daytime temperatures have been in the 70s and 80s -- warmer than I expected around here in early September. 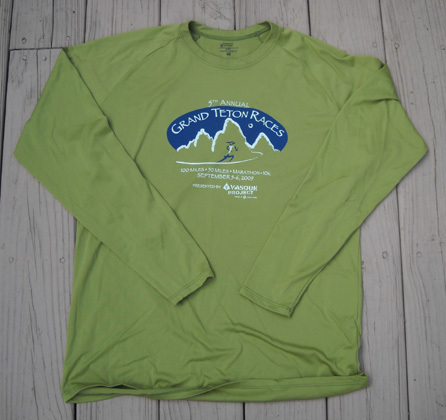 Fortunately, this year's GTR runners missed the snow and wintry weather that made the inaugural Grand Teton ultras extra memorable in 2005. It was still definitely summer this time, with temperatures approaching 90�F. 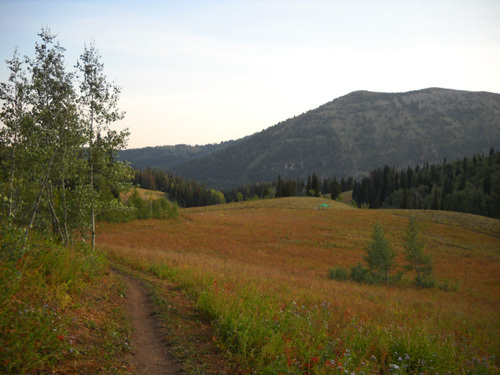 at the lower elevations on the course, which ranges from 7,000 to 10,000 feet. We had similar high temperatures when Jim ran this race two years ago, but this time he was better heat-trained. By afternoon on Saturday the sky became increasingly overcast and a few raindrops fell, but I don't believe anyone got thoroughly soaked along the course. If they did, it probably felt good! 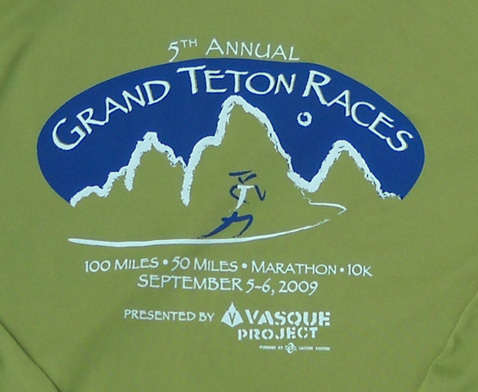 This is the fifth year for the Grand Teton ultras and the first year that a 10K was added to the marathon, 50-mile, and 100-mile menu of options for runners. There is also a kids' fun run. 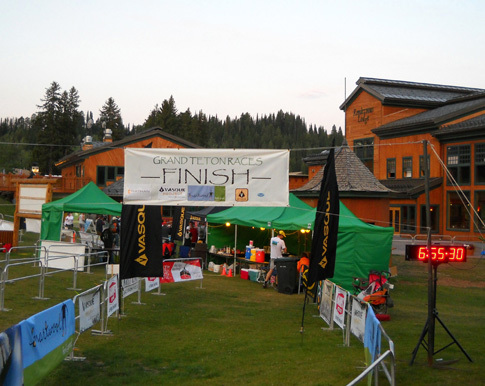 With five different race distances (some on Saturday, some on Sunday), the convenient Base Aid Station where runners are always coming and going throughout the weekend, and a variety of things to do at the resort, this is a very family-friendly race. 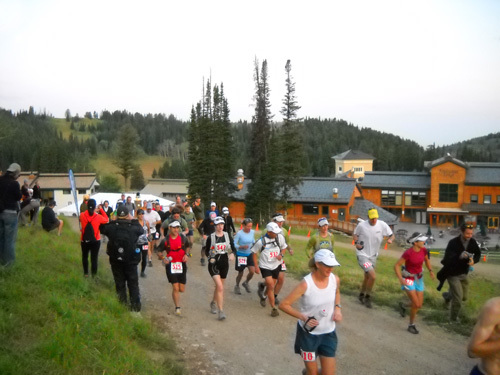 All race activities take place at the Grand Targhee Resort on the western slope of the Grand Teton Mountains. The address is Alta, WY but the resort property is about a dozen miles from the little town that sits on the Wyoming-Idaho border. This is a great venue for the event, with a variety of trails that I showed in the last two entries, food and lodging on site (it's expensive but convenient), and nearby camping options. 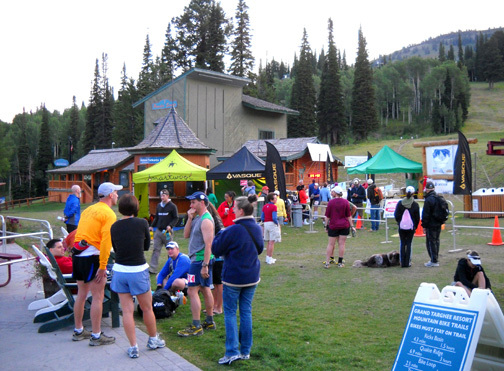 This year the resort allowed runners to camp free on the property on race weekend. 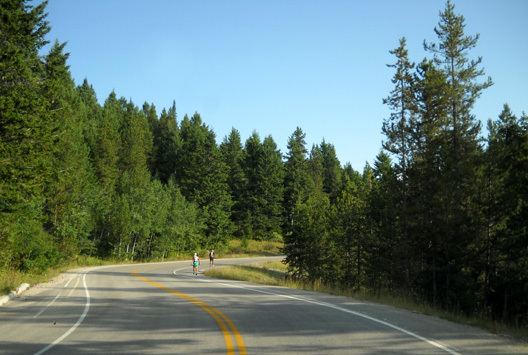 We chose to remain about seven miles away at our NFS campground site in Teton Canyon since Jim was doing just the 50-mile race. If he had entered the 100-miler, we might have moved up to the resort for the weekend. We saw several RVs in the upper and lower parking lots, and tents down in a nice treed area, so it looks like some of the runners opted to stay close to race HQ. I described the course in some detail on Friday in two entries where I showed lots of photos from all around the course. You can also see the course profile there or on the race website. Briefly, all those red and black lines you see above are 25 miles of the course. 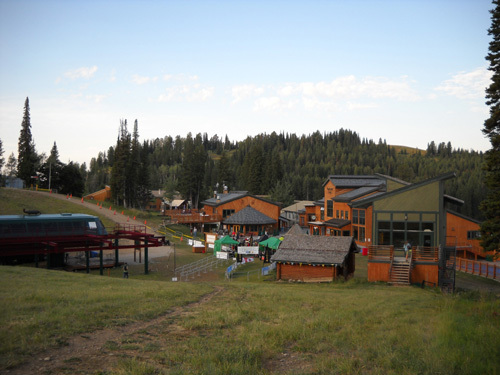 Each 25-mile "loop" has three segments, with the beginning and end of each segment at the Base Aid Station (which is the main cluster of buildings at Grand Targhee Resort). Time limits in the ultras are fairly generous. 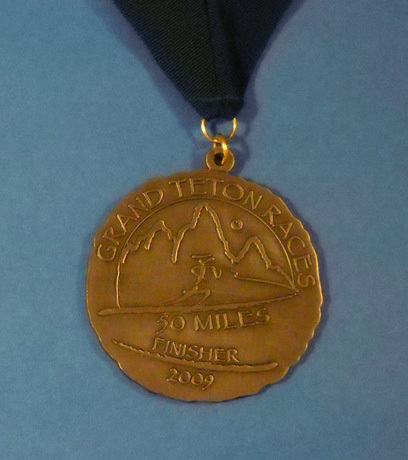 Hundred-milers have 36 hours in which to complete the race. Although the 50-mile limit was advertised as 18 hours this year, the last two runners in that race took 21+ and 25+ hours to finish. 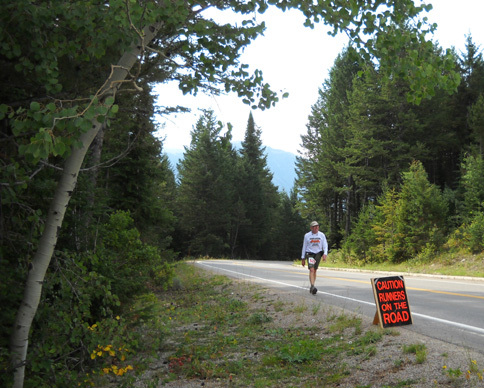 I like that approach, since the aid stations are open for the 100-milers anyway. Packet pick-up for all the races was held in a nice conference room at the resort at two different times on Friday. We drove up in mid-afternoon so we had some time to mingle with friends before and after getting Jim's race number, shirt, and bag. It was fun to see Hans-Dieter Weisshaar and his wife Susi from Germany/Mexico, Francesca (Frankie) Stone and her husband Doug from California, Paul Grimm from Colorado, and George Velasco, also from California. Frankie is all smiles her first time down to Teton Canyon. 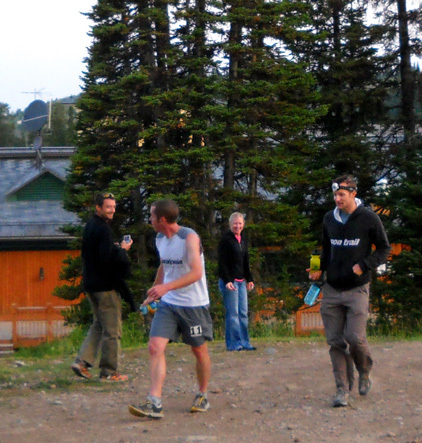 We usually know more runners at 100-milers but those are the only folks besides Lisa and Jay that we knew this time! Could you show a little more enthusiasm, Benji?? What a character! Here he's coming into the Base Aid Station at 20 miles. 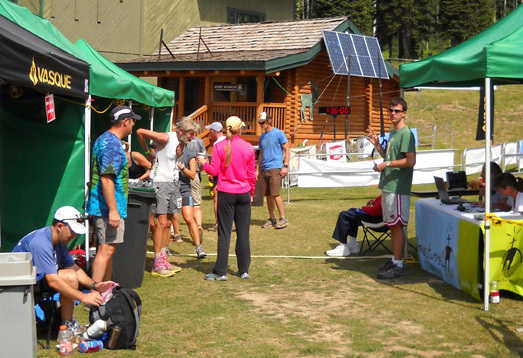 Packet pick-up was casual but well-organized, just like everything else about this little gem of a race. Lisa and Jay are attentive to details yet appear relaxed all weekend, despite the myriad of activities going on. I don't know when they sleep! An informal race briefing was held in a nearby room from 4:30-5:30 PM on Friday. Jay and Lisa described the course, reminded runners of some of the race rules, and answered questions before handing the microphone to Dr.Naomi Sklar, the race medical director, and Sister Mary Beth Lloyd, the inspiration for Lisa Smith-Batchen's prolific ultra endurance fundraising projects for AIDs orphans. And not only would the Sister talk, she'd also run and walk her first 50-miler this weekend!! 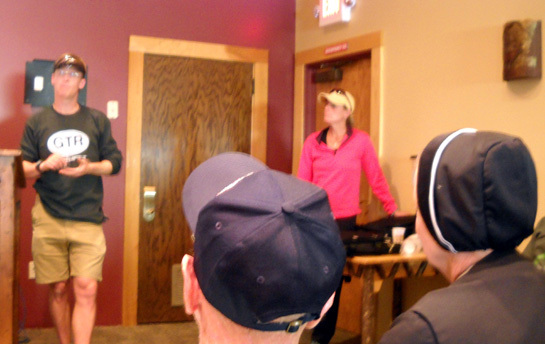 Jay and Lisa Batchen (standing) at the pre-race briefing; Sister Mary Beth is in the right foreground. We opted out of the pre-race dinner at Grand Targhee and ate dinner in our camper. Although it's nice to socialize with other runners over pasta, we prefer races like GTR that don't include $15-20 dinners in their race fees because it helps us reduce costs. 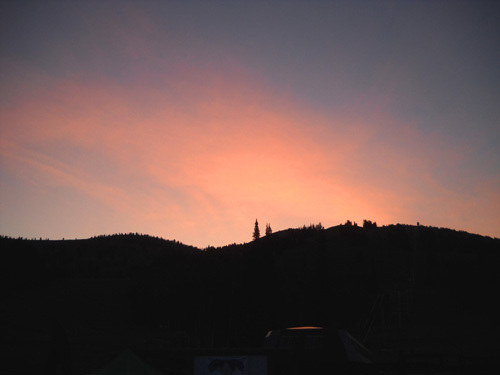 It was partly cloudy and 48� F. when we got up at 5:30 AM for the 7 AM start of the 50-miler. 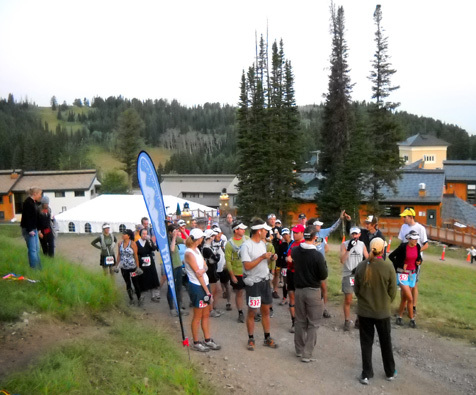 I'm guessing it was colder a thousand feet higher at 6 AM when the twenty-six 100-milers started their race. Jim was one of 36 who began the 50-miler. Jim doesn't usually eat much this early in the morning. His standard pre-race breakfast is a banana and a liquid like Boost (or the Sam's Club equivalent), both of which digest easily. 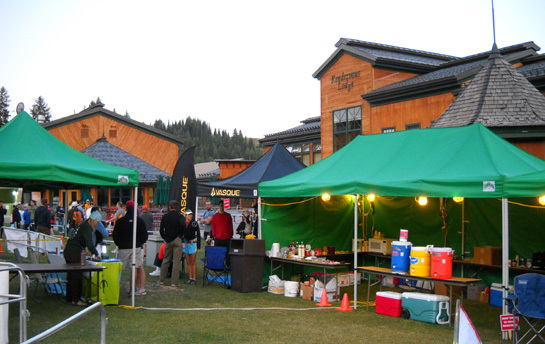 The race also provides the 50- and 100-milers with some pre-race coffee, juice, fruit, and bagels in Wild Bill's restaurant at the resort. 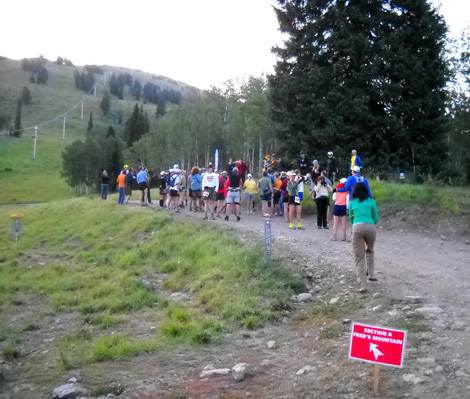 The 50-milers started heading up the short hill from the Base Aid Station to the start a few minutes before 7 AM. Everyone looked pretty relaxed as they talked and waited for Jay to tell them to head on up to the summit of Fred's Mountain, a climb of about 2,000 feet in just under three miles. Above and below: I'm coming, I'm coming! Jim, in white shirt, turns to look back at me in both photos. I'm guessing there was more anticipation than fear their first time up the mountain. By the second time, there may have been more dread! Ty completed that 5.6-mile trek to Fred's summit and back in exactly one hour. 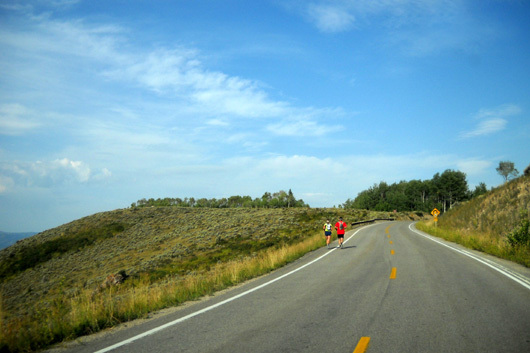 (Here is a link for 100-mile runners' splits.) Although he didn't do the next three trips up and back that fast, he still held on to win the 100-miler. After Jim began running, I wandered over to Fred's Basin for 4+ miles of running and walking before any of the runners reached that loop. It was marked by then, of course, and I could see exactly where we missed the short-cut turn on our training run several days earlier. I really enjoyed that run and wished I could have stayed out longer but 1) I wanted to be out of the basin before the 10K race began at 8:45 and 2) I needed to get back to Base before Jim came down from Fred's. My crewing MO (modus operandi) was similar to two years ago. 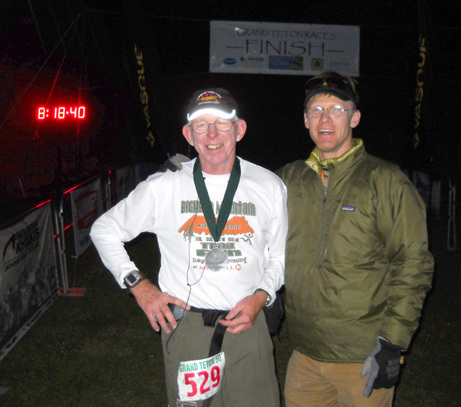 This time I knew Jim wouldn't be out there all night in the 100-miler. That made both of us more relaxed and casual about the whole thing. He didn't need near as many clothes or supplies so he wasn't as dependent on me to crew for him. Jim chose to drink and eat primarily what was available at the aid stations, supplemented with flasks of espresso-flavored Hammergel and cold bottles of Perpetuem that I had available each time I saw him. I was able to get ice at the aid stations before he came in each time. 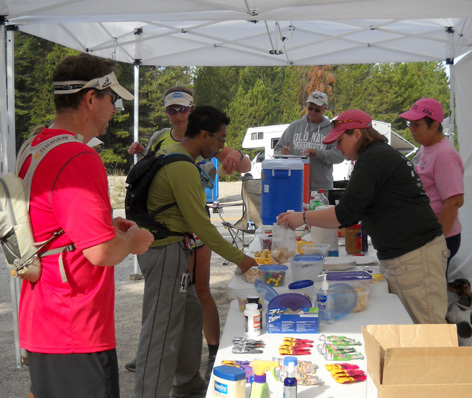 A volunteer helps Jim with food selection at the Base Aid Station. Jim relaxes before the race begins. That's his one drop box on top of the table. We had extra socks, two other pairs of shoes, another running shirt, a Marmot jacket, his Solumbra sun shirt, gloves, an extra hat, a couple of flashlights, spare batteries, lubrication, sunscreen, and other supplies either in the truck or in his drop box in case he needed any of those items during the race. He did not need to change his Injinji toe socks or Asics 2130 road shoes or even use his sun shirt -- the day got progressively more overcast and he never needed it. This is one of the easiest races to crew of any that Jim and I have ever attended. 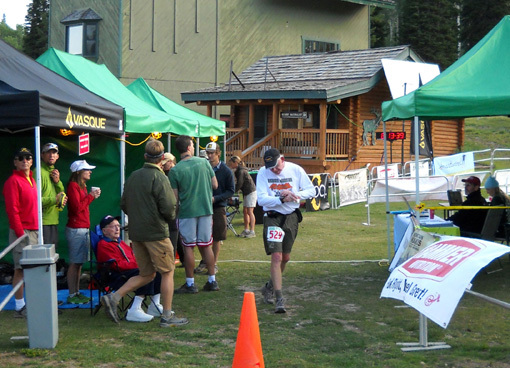 Although it's not as easy as a fixed-time race on a short loop course (think Hinson Lake or ATY), runners come through the Base Aid Station at the start/finish every five to fifteen miles -- six times in the 50-miler, twelve times in the 100-miler. 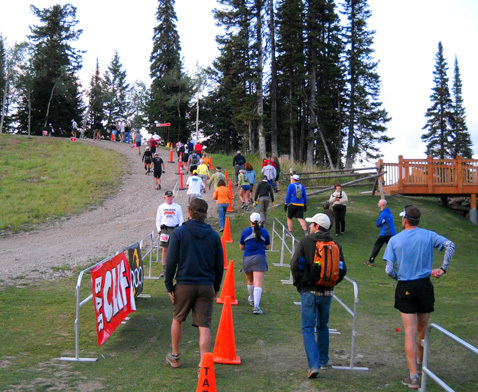 Crews are allowed to drive to only two other aid stations, both along paved Ski Hill Road (runners have other manned and un-manned aid stations). They are easy to find and there is ample parking at each one, since there aren't a lot of runners in the race and they get spread out quickly. 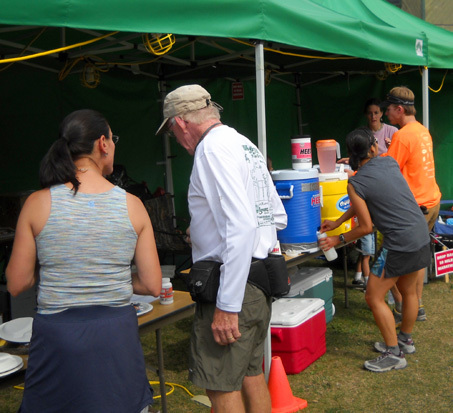 Some folks like Susi set up a chair and boxes with their runner's supplies only at the Base Aid Station. Crewing doesn't get much easier than that! Although she and Hans drive a small RV, it's easier to leave it nearby in the parking lot than to drive it to aid stations. 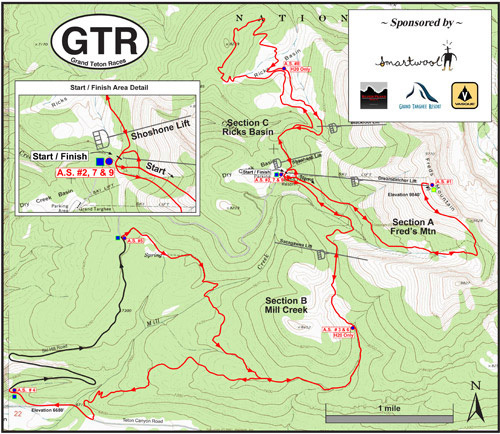 The stations on Ski Hill Road are well enough staffed and supplied that runners can get by pretty easily at GTR without crews (they can have drop bags there if they want them). Susi relaxes and waits for Hans to come into the aid station on Saturday morning. I set up our chair on this side of her. No one bothered our supplies when we left to do other things. Susi is better able to occupy herself for hours at a time in her camper after Hans goes out on another segment than I am in our truck . . . so at this race I prefer to set up a chair at Base and move Jim's crew box(es) between there and the other two aid stations throughout the race. It gives me more to do. Jim doesn't usually need me there, but it makes my day more interesting to see him and the other runners more frequently. 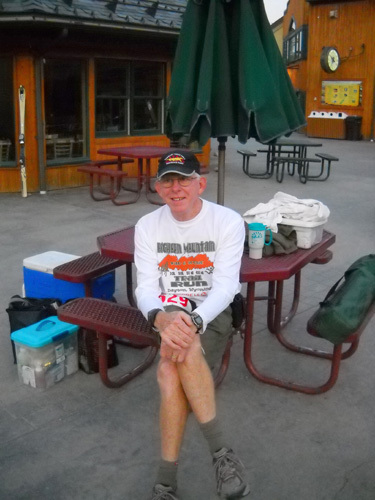 I'm too fidgety to just sit and read, and no one needed my help at any of the aid stations during the day. 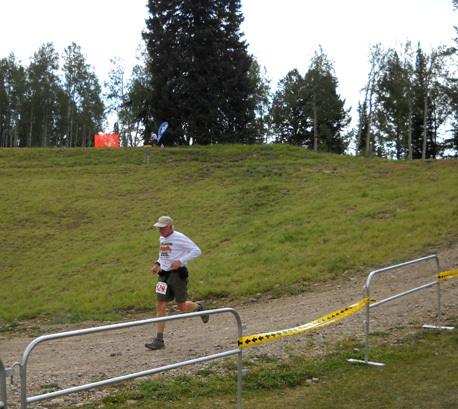 I saw Jim all six times he came through Base (including the finish), twice at Lower Ski Hill, and once at Cold Springs. I missed him the second time he came through Cold Springs at 36+ miles because I drove down to Driggs to get e-mail, make some phone calls, and buy milk (we'd been warned that most stores in Driggs are closed on Sunday). Runners come up the road to the Cold Springs AS and turn onto a dirt jeep road next. Even though I was coming and going all day I ended up spending a lot of time talking to Susi at the Base Aid Station anyway. I enjoyed that. Hans often came through a little before Jim, so Susi and I were usually there about the same time. 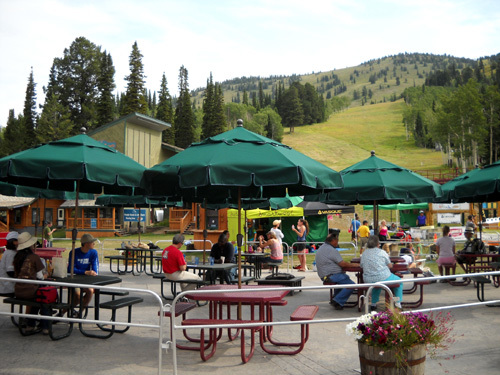 Spectators can sit under canopies, eat lunch, and watch the runners from a distance or get up closer. as Frankie Stone comes into Base from the Mill Creek Trail section. Two years ago Susi and I decided to surprise our fellas by taking the chairlift up to the summit of Fred's Mountain the second time they ran that section. It was great fun for us. We took advantage of the Lunch & Ride ticket, which was a good deal then at $15. This time neither of us went up there on the lift. I'd already hiked up and run down earlier in the week and didn't want to pay the increased price for the ticket this year. It just wasn't as appealing an idea as it was the first time, I guess. Been there, done that. In addition, now I'd have to deal with all the cyclists on the chairlift . . . 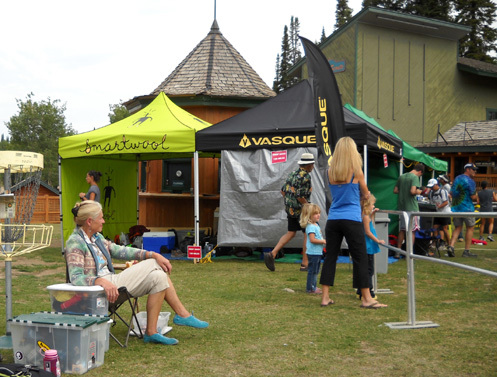 The Base Aid Station got even busier in the afternoon when lots of downhill mountain bikers showed up. It was the same on Sunday. I talked about the popularity of the new bike trails on Fred's Mountain in an earlier entry. 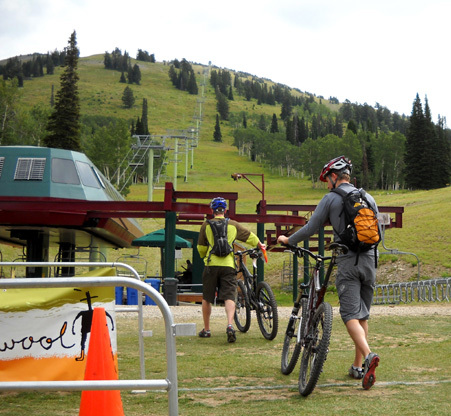 The cyclists had to cross the race course near my crewing spot (below) to get to the Dreamcatcher chairlift that took them and their bikes up to the summit and the beginning of their downhill trails. I was surprised so many of them would come out during the foot races, but the weather was good and their season will be over soon. This is very different from two years ago. These guys aren't wearing the leg and arm pads that many of the other downhill cyclists had on. Jim said he had to be careful going up and down the mountain the second time. The bike trails cross the race course several times and the cyclists didn't always yield to the runners on the road as they were supposed to. 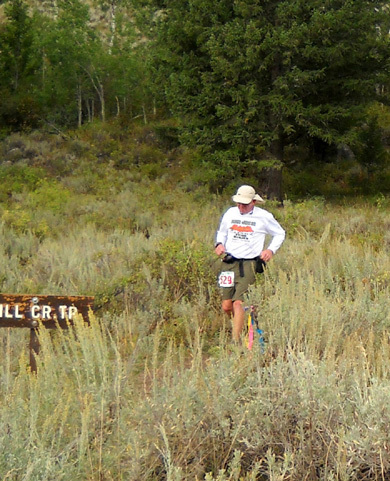 He saw only one cyclist on the Mill Creek Trail during the race (no problem with that one) and none in Ricks Basin. Jim looked great at all the aid stations. Unlike two years ago at this race, he had no problems with eating enough calories and drinking enough fluids. He didn't get nauseous, dehydrated, or hyponatremic this time. He was glad the sky was overcast most of the afternoon to mitigate the high temperatures. Jim approaches the Cold Springs AS at 14+ miles . . .
. . . the Base AS at 20 miles . . .
. . . and back to Base at 25 miles -- halfway done and still running strong! Although he slowed down gradually as the day progressed, Jim's energy level and motivation remained good. It really helped him mentally to know he was going "only" 50 miles and not 100. He had more fun talking with other runners and enjoyed the scenery more this time, all while staying ahead of his projected splits. That's the way to run a race! After almost missing him at the first aid station stop because he got down from the summit of Fred's ten minutes "early," I made sure to get to each aid station well before I thought he'd arrive. 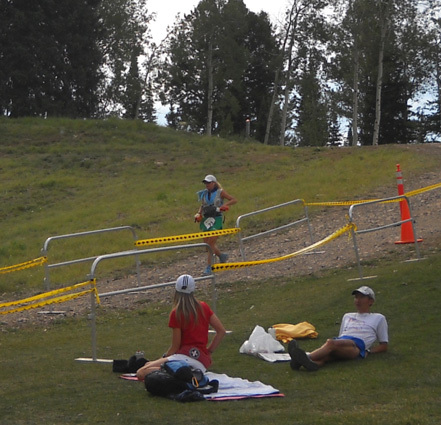 Lisa and Jay are pretty accommodating about runners being paced in the ultras, especially those over age 60. Jim was doing so well at the end that I didn't feel the need to accompany him on his last five miles in Ricks Basin, but I did walk up the hill with him as he began that loop about 7 PM and out about a third of a mile. Since it might get dark while he was out there, he took his flashlight on that loop. Jim runs down the Mill Creek Trail to its trailhead at Teton Canyon Road . . .
. . . and follows it to the Lower Ski Hill AS at 36 miles. 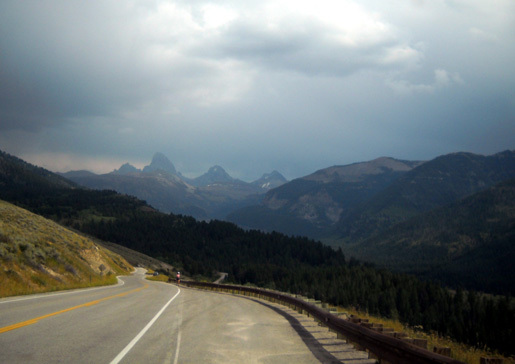 Note the distinctive Grand Teton Range. In retrospect, I wish I'd run/walked that section with him because I love the basin trails so much. Instead, I went back to move the truck closer to the finish area and took more warm clothes over to our chair just outside the aid station tents. He was back by 8:17 PM. See the time in that photo? Jim wishes it was his race time, but alas, it's the time of day! Dr. Naomi was working in the Base Aid Station when Jim finished. She quickly bundled him in a warm blanket while I got him some hot soup to eat. As soon as the sun sets in the mountains, the temperatures drop precipitously. Jim gets cold very fast after a race even on a hot day. He put on pants and a jacket when he was ready to walk to our pre-warmed truck. Once back at the camper, he discovered a blister just below his ankle bone on the outside of one foot. Luckily, it didn't start to bother him until four miles from the end. He just toughed it out, knowing he didn't have far to go. It should heal quickly and not bother him when he's ready to resume training. We slept late on Sunday morning and missed the start of the marathon at 7 AM and the kids' fun run at 9. We drove up to the start/finish area about 10 to see how folks were doing. 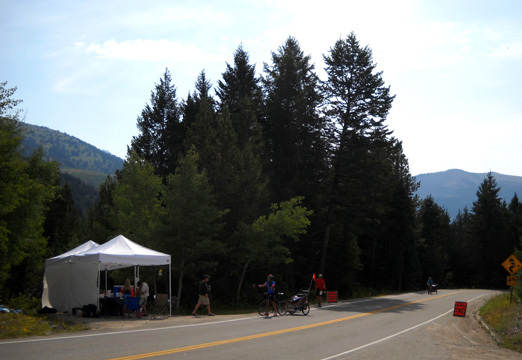 We saw quite a few of the marathoners walking up the dirt road in the canyon and on Ski Hill Road, as well as a few 100-milers. The 100-milers still had plenty of time left; their final cut-off is 6 PM on Sunday, and a few would take most of that time to complete their journey. Overall winners in the ultras received a framed, larger plaque. Very classy! You can see results for all four races at this link. GTR has provided prompt and accurate live results during the race for several years, one of many special features of this event. 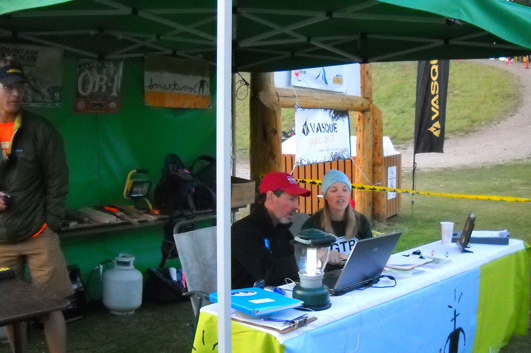 Timers input data as the 100-milers begin coming into the Base Aid Station. 100-miler: 69% finish rate (18 of 26 who started). First male = Ty Draney in 19:19:51. First female and 2nd overall = Ashley Nordell in 23:03:39, which I believe is one of three new course records this year. 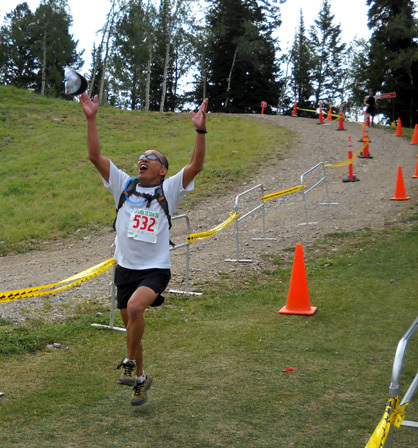 Last finisher, George Velasco, finished in 35:33. Our friend Frankie were unable to finish this time but I bet she'll be back! 50-miler: 92% finish rate (33 of 36). 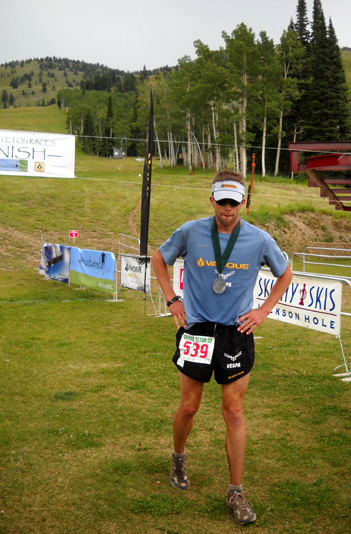 First male = Duncan Callahan in a new course record of 7:33:27, not bad after finishing 3rd recently at the Leadville 100! First female and 7th overall = Becky Kirschenmann in 10:34:06, also a new course record. Jim was 20th in 13:17:40. 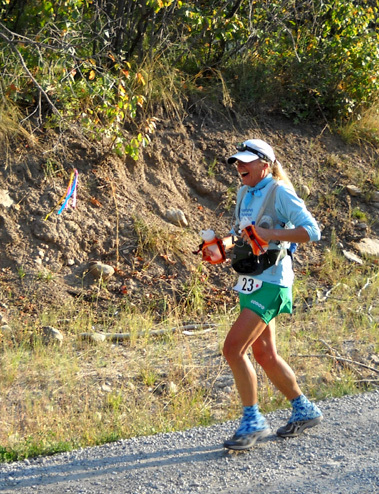 Last place finisher Andrea Pritchett was on the course for 25:27 hours. Marathon: 87% finish rate (40 of 46), with a time range of 4:26 to 8:20 hours. I am surprised the race hasn't grown larger in five years, considering all the special features, generous time limits, and gorgeous scenery. This race is a gem. Actually, I'm glad it's not big because each runner, crew person, and volunteer is treated with considerable care and respect. 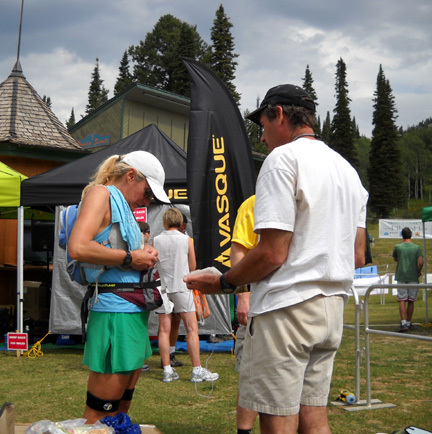 Lisa and Jay are two of the most appreciative and best-organized race directors we know. I really enjoyed talking to them while I was waiting for Jim the first time he came through the AS and when I returned from a run I did on that part of the course (I'd missed it on my earlier training runs). Cody had fun meeting their young yellow Lab (Marley, of course) and mini dachshund, Rosie. This 100-miler will eat you up and spit you out if you aren't physically and mentally prepared for it. 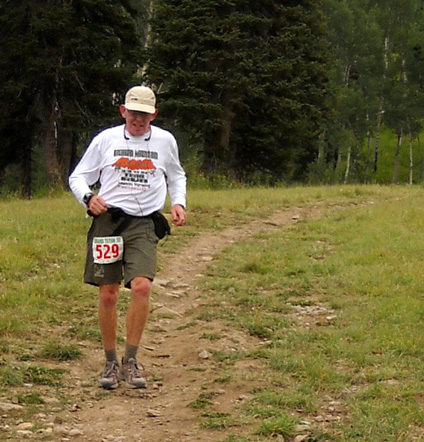 Even with a fairly generous time limit, the high altitude, significant elevation gain and loss, variable weather, and repeated loops can wear on even the best-trained runners who have finished other mountainous 100-milers. It takes a lot of determination to keep going "out there" time after timje after time (twelve times in all!) from the comfort of the Base Aid Station. 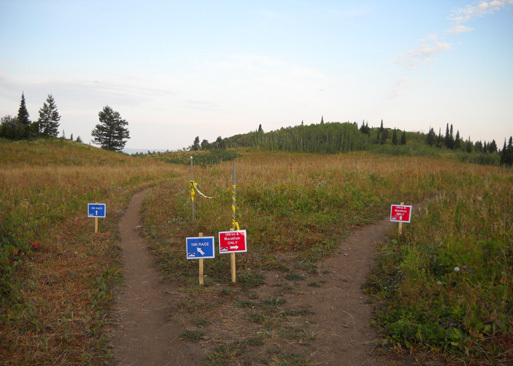 The course demands more respect than you'd think. Every runner has a story; I'll comment on just three of the most determined of them that I know about here. 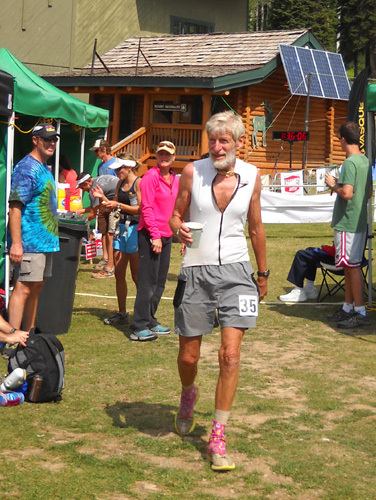 Hans-Dieter Weisshaar, age 69, finished 12th overall in the race, looking almost as fresh when I last saw him Sunday morning as he did when I repeatedly saw him on Saturday. Known for finishing over a hundred 100-milers in his 60s (I've lost count), GTR is one of six 100s Hans plans to run in the next six weeks. He spent most of the summer running long distances in Europe to prepare for this feat. Hans and Susi are one of my favorite couples. 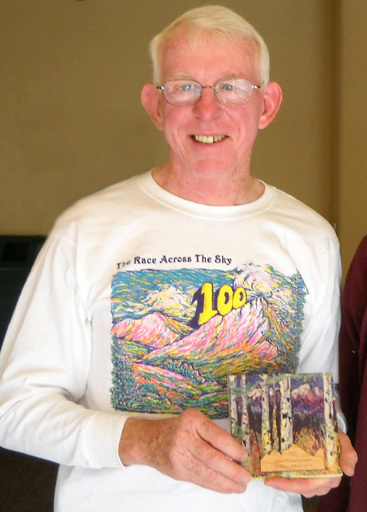 Susi says Hans may "hang it up" when he turns 70 but she and I both hope he continues running ultra races for a long while yet (our reasons are different -- she has to live with all that energy, and I just want to keep seeing them!). George Velasco has run this 100-miler four times; this is his third finish at the back of the pack. He is tenacious! 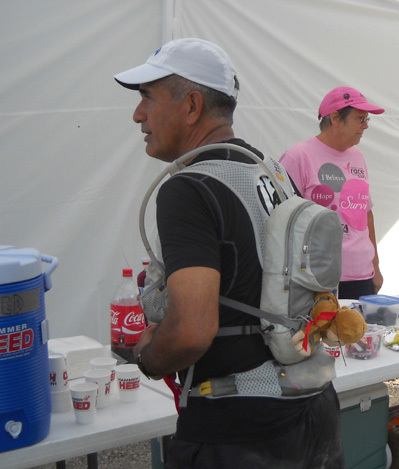 I noticed the stuffed toy strapped to his water pack during the race and asked him about it. He said it represents the "monkey on his back" from last year's DNF. All the comments he received during the race helped motivate him to keep going. 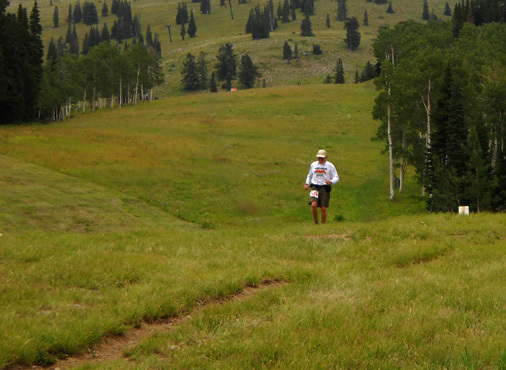 George also comes early to the Tetons to help Jay mark the course each years. Thank you, George! 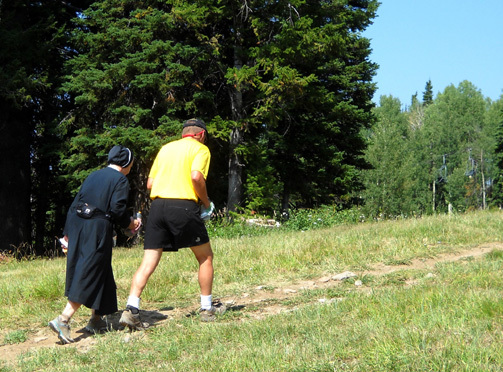 Sister Mary Beth Lloyd was an inspiration to many of us who were either running the race or observing it. 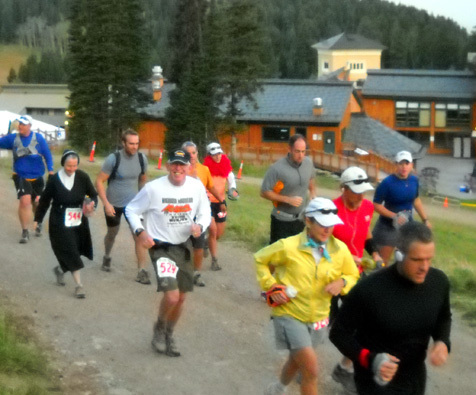 Sister Mary Beth and her pacer head out to Ricks Basin at 20 miles. 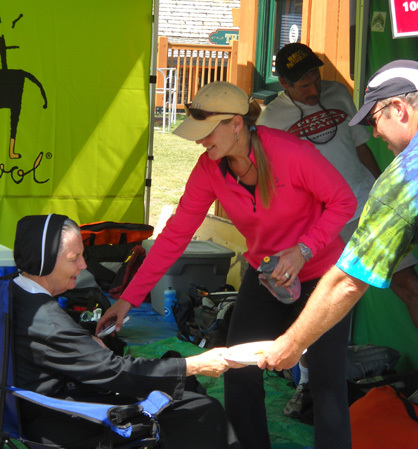 In her 60s, and wearing her long habit the entire race, Sister Mary Beth doggedly walked her first 50-miler on one of the more challenging courses this country has to offer. She was the next-to-last finisher in that race in 21:21. Not bad, especially when you consider that she lives in New Jersey and can't acclimate up to 10,000 feet anywhere close to her home! I'm very proud of Jim, too. He managed everything very well in this race and finished faster than he thought he would. Even better, he had FUN this time! Good job, Sweetie. 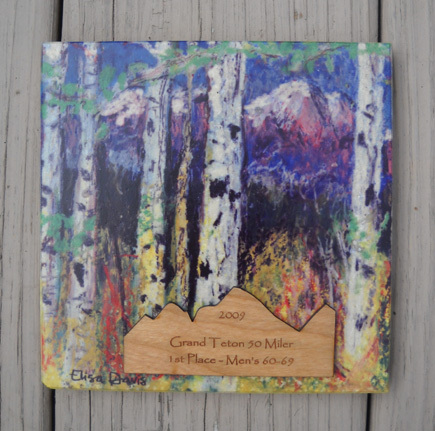 Check out our Picasa site for additional race and course photos (and larger versions of the ones on this website).